You only have to look up the #3minutebellyblitz hashtag on twitter to see the hundreds of rave reviews and transformation pictures from Charlotte's 3 Minute Belly Blitz. I managed to resist the hype whilst everyone else was on their January Resolution fitness mission, but since I've kept up my fitness motivation and routine I decided to give in and give the 30 Day Shred a rest. Geordie Shore's Charlotte Crosby looks fab and her workout DVD promises results from short, 3 minute exercises. The main instructor, Richard Calendar from ITV's Biggest Loser, runs through the moves before you get started and the other instructor, weight loss expert David Souter, explains how to adapt the moves for beginners or if you're finding it too hard. This is good because once the workout gets started it's quite quick paced - you've only got 3 minutes after all! With really short rounds you don't get bored or demotivated. If it's moves that you're struggling with or you're starting to get really out of breathe you know it'll be over soon. I soon discovered which ones are my favourites, which ones really get my heart rate up and have me sweating, and which ones I find a bit more tricky. It's great being able to mix and match my workouts depending on how much time I've got. The first week I worked my way from only doing a few of the workouts right up to 10 workouts by the end of the week. Since then I've been able to do the whole DVD including the extra abs section. Be aware though, the whole DVD ends up taking around an hour so it's not as easy peasy as the 3 minute promise sounds. To see results, of up to 5 pounds a week, you're meant to do the DVD 4 times a week. I didn't quite lose 5 pounds but I did lose weight and I started to have non-scale victories! The DVD covers everything and has you doing cardio, in HIIT form, without having to do any running at all. For those interested in trying the DVD out I've broken down the 12 rounds so you can see how the workouts are built up. It's quite handy to know what round is what for when you're mixing and matching the workouts with other things. Just short of 7 minutes this workout is a mixture of cardio and stretching. Using punching, kicking and quick sidestepping your heart rate starts to rise ready for the proper work to begin. This workout is centred on a bit of kick boxing, using punching and jumping for the first cardio round. It's quite good fun but really gets you working. Using lunges throughout this resistance training round you raise your heart rate and really work your legs. I find it quite hard to stay at their pace and do really deep lunges. Another cardio round this one is all about punches, knees and jumps. A resistance round using press ups and floor exercises. This has got good variations for beginners. This one is my favourite cardio round. It's all about skipping and jumping. Another cardio kickboxing round. This one is quite repetitive so once you get used to the moves and into the rhythm it's actually quite good fun. This round is all about the squats and lunges. A difficult follow up to round 8, this one is all about squats and jumps in the form of HIIT training. Again they've got good variations for beginners but the challenge of jump squats is definitely worth it! The one I've found the hardest so far. This workout is all about push ups and lunges. Quite an easy workout to finish off, this one is all about the glutes. A combination of different leg raises you can feel it working in a short space of time. A 10 minute workout designed to tackle the abdominal muscles. With good advice about breathing I can really feel this working and always see a difference in my stomach straight after. 7 minutes of stretches and breathing to bring your heart rate back down and prevent injury. I'm into week 3 and I've not lost any motivation, I've even found myself doing the Extra Abs workout twice in one night! 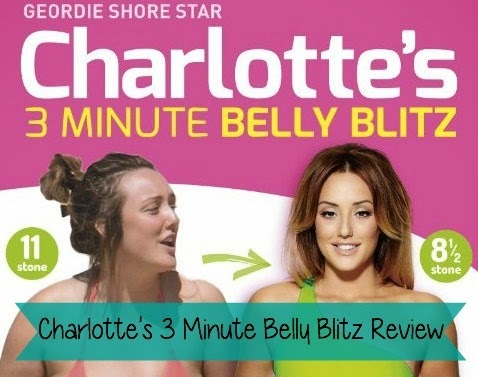 Have you given Charlotte's 3 Minute Belly Blitz a go?